← Andrew Lee: Eat to Perform! 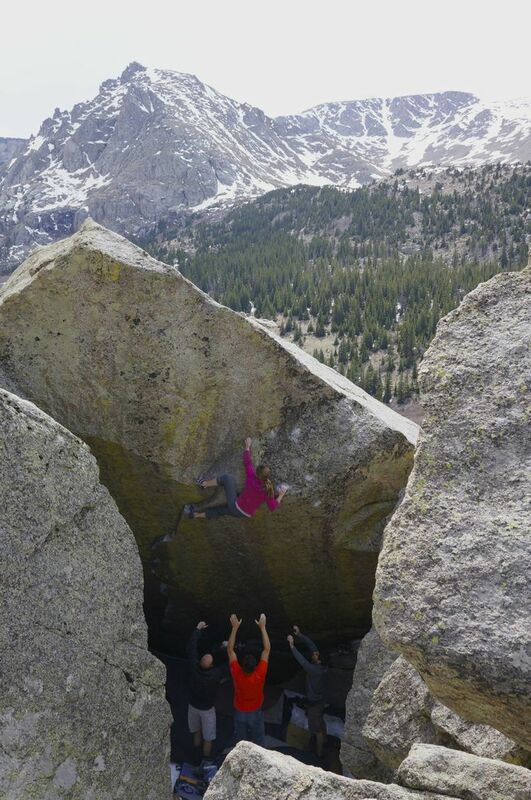 Last month, Angie Payne sent Freaks of the Industry, a V13 at Rocky Mountain National Park in Colorado. In 2010, Angie’s ascent of “The Automator” made her the first woman to climb a confirmed V13, and Freaks of the Industry is the second of the grade on an impressive tick list. When Angie was in town in May for the Dominion RiveRock Boulder Bash, she was kind enough to sit down with me for an hour or so to talk about climbing. More specifically, we talked about the idea of weight gain and loss in climbing, and how it had affected her personally, and professionally. Her story is a personal one, and as she said repeatedly: talking about this is important. Talking about it is even more important. She has been incredibly generous with her time during the writing of this article. Climbing is – and always has been – a game of numbers. Grades are important, obviously, but so are inches. How many people wish for the extra length in their arms to reach that finish hold? And what about ounces? The gear industry is hyper-focused on shaving weight from its equipment, implying that lighter is not just better: it’s what you need to get the send. Strength-to-weight ratio – the principle behind such statements as “you’re pretty strong, for a skinny little thing” – is fundamental to rock climbing. When the athlete’s equipment is limited to the athlete herself (more or less), that equipment needs to be in top condition. It needs to be primed to perform, and it has to have that perfect balance of power and lightness to perform well. Many people have struggled with that balance, and many have struggled with weight-related issues. (I hesitate to use words like “eating disorder” or “anorexia” because those are specific, diagnosable issues. I am not a doctor, and I’m not writing about those specific problems. I’m writing about the bigger issue – the struggle every climber faces at some point and to some degree.) And while we may skirt around those issues (“I can’t eat that candy bar because I want to send my project”), not many people like to talk about it bluntly. Several years ago, Angie was faced with a desire to be light, and was successful. The effect it had on her climbing was measurable – though not all of the effect was positive. Angie’s willingness to talk about her own struggle to come back from that lightness was inspiring, and encouraging. I hope that her candor will motivate dialogue among you and your climbing partners and friends. Whispering about how skinny people are makes it easier for them to continue to be too skinny. Starting a conversation is harder, but talking is key. “On some level,” Angie said when we talked, “every climber struggles with it. Every time you pull up, you’re aware of it. Some struggle more than others.” She was talking about weight, and the amount of force required to move a body from one hold to the next. The climbing world is obsessed with weight. Not size, necessarily, but weight. The lightest gear is the most expensive gear; years’ worth of research and development goes into making this company’s carabiners lighter than that company’s. Ounces in the wrong place make the difference between a send and a fall, the advertisements tell us. And after a point, you can only shave so many ounces off of your quickdraws. The next logical place to lose the weight is from your own body. The idea of “feeling heavy,” she said, is one that gets in your head and doesn’t disappear. It becomes the reason for failure, and something that can be controlled more easily than the rock. The only thing to do is to be lighter. I don’t know how much Angie weighed when she was at her lightest – she didn’t tell me, and I didn’t ask. It doesn’t matter, really, anyway – the number on a scale is meaningless. Her words on the experience were far more powerful than a number could ever be. At some point, Angie realized the problem she was dealing with, and learned to recognize and avoid the “danger zone”. Getting too close to the danger zone means you start to spiral out of control. “The trick,” she acknowledges, “is knowing how to manage it.” She says she doesn’t diet, but “tries to eat simple”. It’s hard, spending as much time on the road as she does, but she manages to have a better diet than most people (she supposes, and she’s probably right). When it comes to eating habits, she doesn’t like rigidity. That can lead to obsessiveness, which is bad. Flexibility is important. Being willing to bend occasionally means you’re less likely to break. “Stay the course,” even though it can be hard sometimes. Being strong means weighing more. And even now, she’s aware of how muscle gain will affect her. A muscle that’s not specific for climbing may be more weight than she wants to carry up a boulder with her. But broad shoulders and beefy forearms? “It’s more weight, but it feels good.” She pointed to the World Cup finalists – healthy-looking women. Strong, powerful climbers who reinforce that it’s okay to not be small. It’s hard to be small and stand on top of a bouldering World Cup podium. Angie’s experiences are not unique. The desire to be stronger is a part of the sport of climbing, and with that comes a desire to be as light as possible. It’s very easy to say that sometimes being too light is unhealthy. It’s much harder to put that knowledge out of your head when you’re failing on your project again and again. 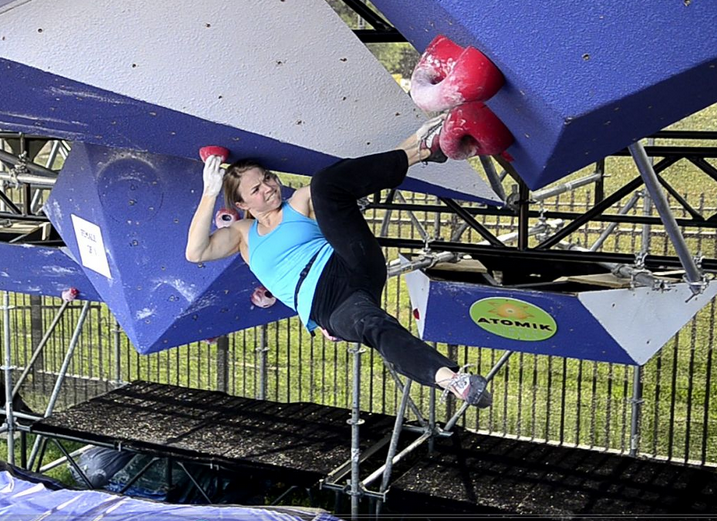 “Every climber that’s climbed has thought about this,” she said. It’s not restricted to an age or a gender or ability level. The key is open dialogue, and trusting your climbing partners with more than just your spot. Every climber will battle with the desire to feel lighter – there’s nothing wrong with the desire. The danger comes when the desire becomes all-consuming, and leads to poor choices and dangerous decisions. The danger is in being too light, just for the sake of a send. You can read more of Angie’s words on her personal blog. This entry was posted in Discussion, Training. Bookmark the permalink.